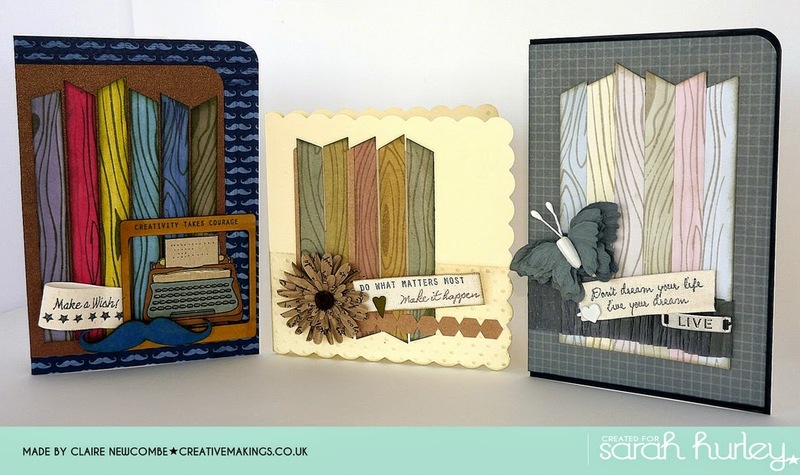 Good Morning from me (Claire N) and its lovely to be able to share with you this morning three cards that have been inspired by items that are (probably) familiar to us all these days. 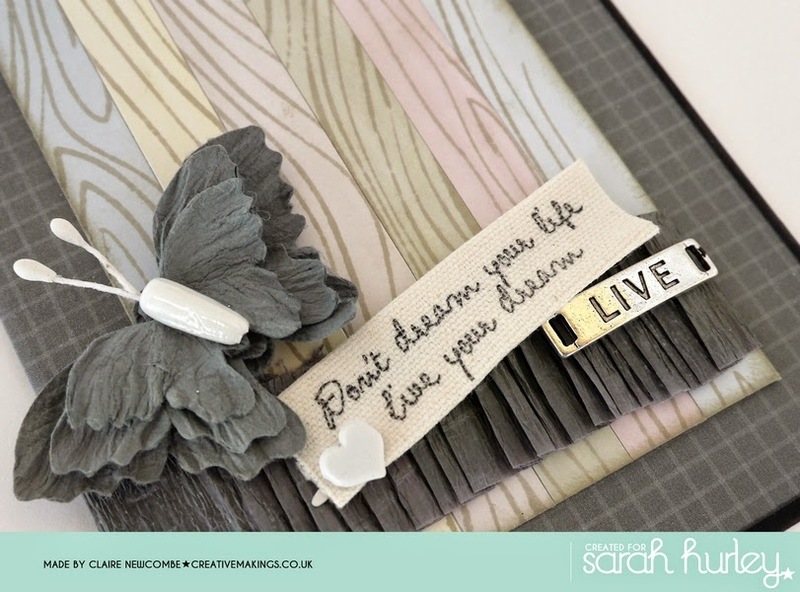 There is a trend in home decor at the moment, where we see inspirational quotes printed onto a what looks like a driftwood wall plaques or panels. There are many quotes and sayings (too many for me too chose from to be honest...LOL!) but I really enjoy reading through them and particularly I am really taken with the colours and textures of the panels on which the are printed. So with that in mind, I wanted to have a go creating a card in that style. 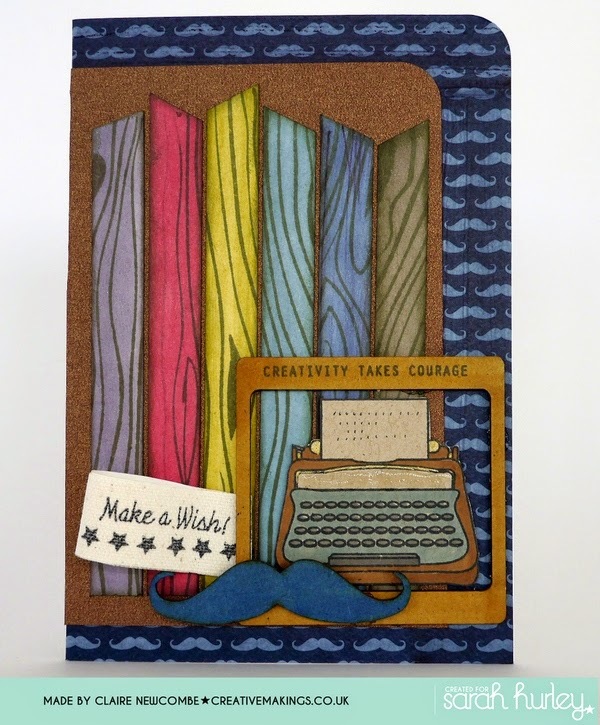 You can see that I have created 3 cards, in different styles and colour ways, with the coloured panelling. 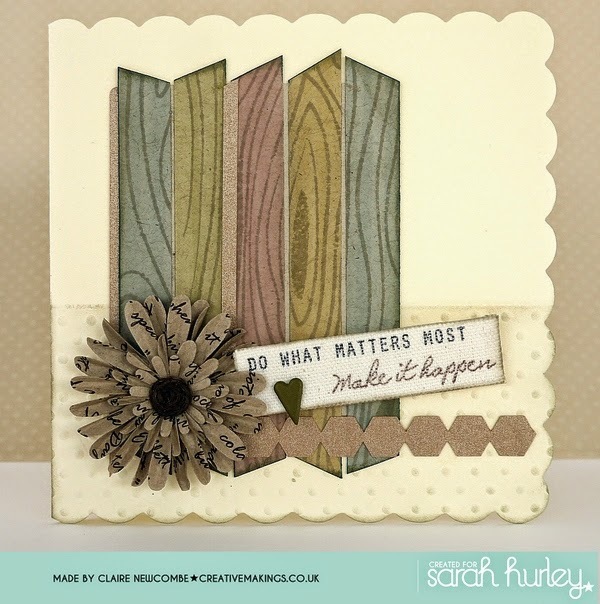 The panels were created using Sarah's woodgrain backing stamp stamped onto card, then cut into strips, and the end trimed to an angle. The strips were then coloured with promarkers, and it is at this stage you can have some fun and use your favourite colour ways. 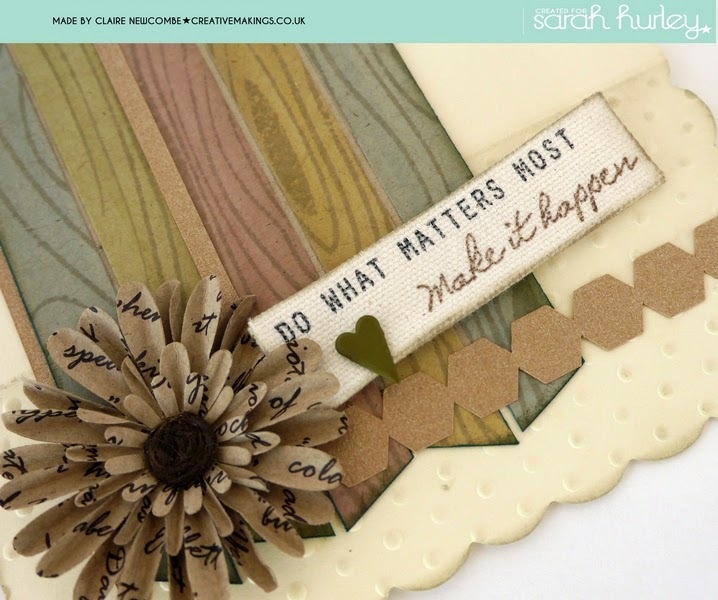 This first card, I stamped the woodgrain onto Kraft card, so that when coloured it offers a slightly muted colour palette and offers the perfect backdrop to the gorgeous kraft paper flower. The tiny hexagons are cut using one of Sarah's silhouette cutting files (and thank you to Carol for cutting tehm for me, as I don't have a silhouette myself) are colour matched perfectly. 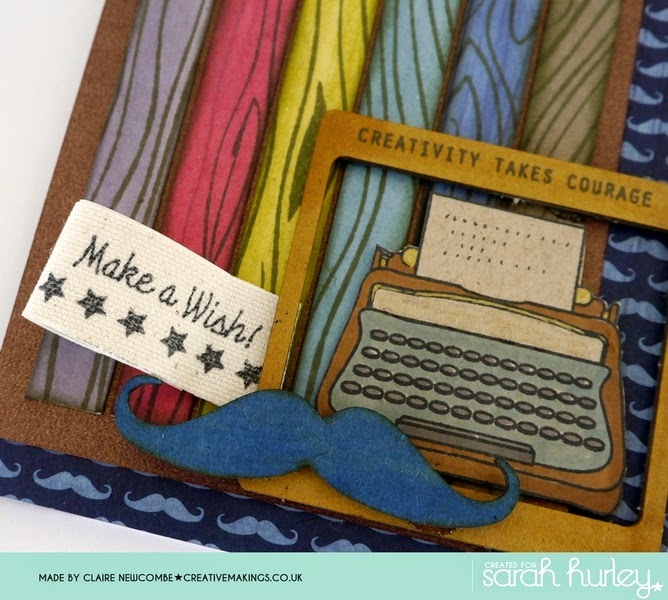 Here, I have stamped onto white card, and coloured with pastel colours. The dark grey of the backing makes the colours subtly stand out i think. With this card, I went bold (stamping onto white card again) and have shown that this style can also work for cards for the guys. There is an element of continuity with all three cards, because I have stamped the words (using momento ink) onto self adhesive canvas - i like the contrast of the texture. 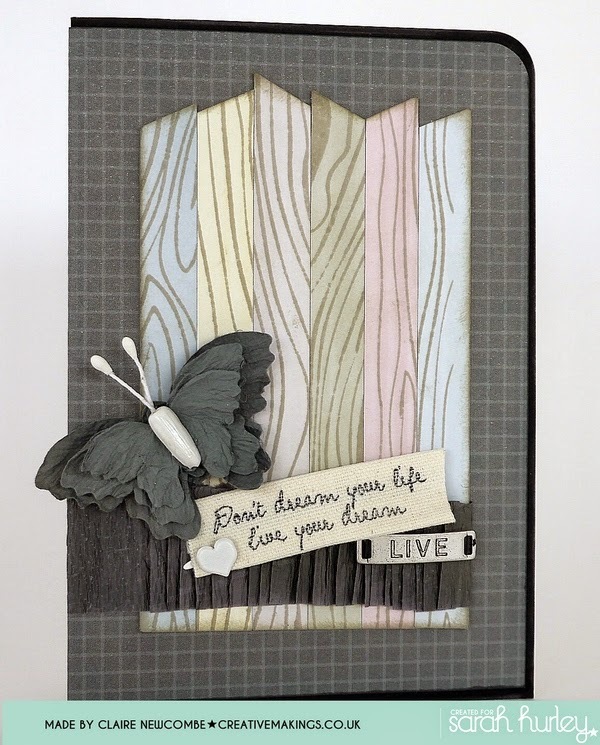 All the chipboard embellishments, paper flowers and butterflies can be found in Sarah's shop (here) and I really enjoyed using them as the focal points of these cards. I love them all Claire, but the butterfly one is my favourite.